Cookies In Bloom, online at cookiesinbloom.com sells delicious home baked cookies, brownies, cookie cakes, rice krispy treats and beautiful cookie gift baskets for all occasions. Cookies in Bloom makes cookies to order so you can ask for anything you like when choosing from over 300 shapes. Customize your message cookies with any thought or sentiment. Cookies in Bloom ships all over US. Stop by 58coupons for best Cookies in Bloom savings, promotions and discounts. 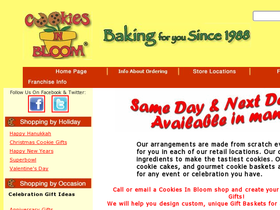 Hurry on over to Cookies in Bloom to save $5 on any product with this coupon code. Save 15% on all orders from Cookies in Bloom when you use this code at checkout. Click link to get started. Enjoy delicious brownies from Cookie in Bloom for as little as $29. Click link to begin. Follow this link to buy gift baskets from Cookies in Bloom starting at only $29.99.